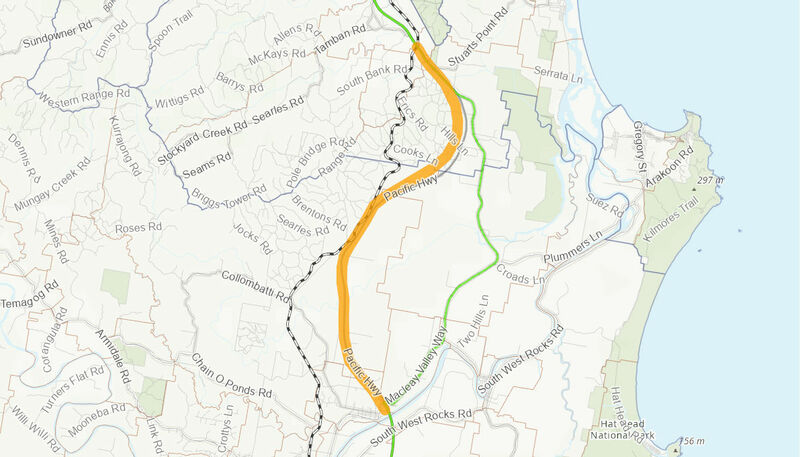 The Frederickton to Eungai upgrade project constructed approximately 26.5 kilometres of four lane divided highway on a new alignment to the west of the old Pacific Highway. The southern end of the project connects to the existing Frederickton interchange. The northern end of the project connects to the current dual carriageway on the northern side of the Main Northern Rail line at Eungai. The project includes two heavy vehicle rest areas and a new grade separated interchange. The project has improved road safety, reduced travel times, reduced freight transport costs and improved economic efficiency. The total cost of the project is $565 million. The Australian Government is providing $282.5 million and the NSW Government is providing $282.5 million towards the construction of the project. Thiess and McMahon Contractors was awarded the contract to design and construct the project on 19 December 2012. Major works commenced on 20 August 2013. A staged opening to traffic commenced on 16 May 2016 and all major works were completed by 27 July 2016.